Charles here (though Sean will take this over). The queasiness I was suffering seems to have gone away. I'm back to enjoying trail food. Part of our challenge was that in Idyllwild we decided to go stoveless. This streamlines our days and simpifies our mealtimes. We shipped our stove ahead of us up the trail, and have been experimenting with satisfying meals & snacks. Anyway, we seem to be doing fine now. Now to Sean. We woke up very cold beneath the giant Jeffrey pines--chilly and dampish. Chris informed us that he had a pair of night visitors: a large wolf spider that crawled across his sleeping bag then later he woke up to find a different furry 8-legged friend snuggling up to his new beard, and he flicked it away into the night with a shudder: a small tarantula. It was a good strong hike along a steady flow of creek today. 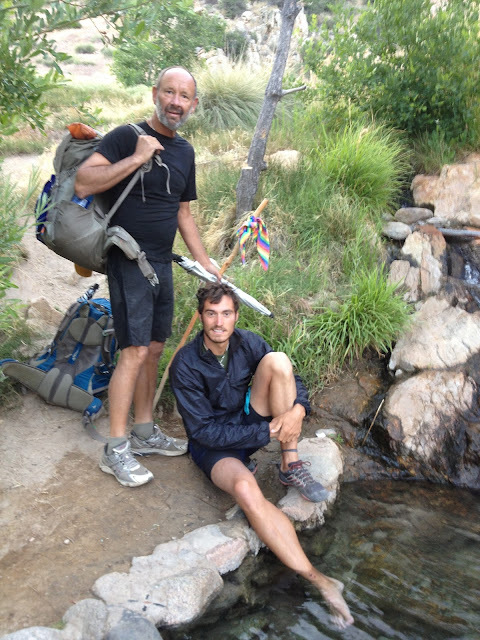 We paused in a couple of pools joining other thru-hikers wading and splashing in the cold, slightly greenish water. Of course we rinsed our dust-infused socks too, and Chuck and I serenaded (by request) three other hikers (Moonwalker, Mark Trail, & Nancy) with "Yellow Bird." Despite our broad-brush idiosyncrasies, we have yet to earn trail names -- except we're known as the Gay Caballeros, or just The Caballeros. Mid-day we swam at a gorgeous wide swimming hole in the creek. Hot as the day was getting, this was a welcome refreshing stop. Dionysus, Houdini, Pan, and The Donald. Then there was the long, hot trail that was under re-construction (we didn't take the re-route). It was beautiful, but difficult -- with lots of places the trail wanted to slip away under you. [Charles here again. Sean left out the part where the trail running for miles along the steep (& sometimes sheer) canyon slopes high above Deep Creek kept trying to eat him. It got a little violent at times. This part of the trail is actually "officially" closed for repairs and there is a detour - but many thru-hikers take the PCT route here anyway. The views are spectacular. But you must mind the narrow crumbly path. But Sean had some narrow escapes where his eyes wandered to the view and he misstepped - the path gave way and he pitched forward with scrapes and cuts (no broken body parts) the result. He was cheery about it, tho.]. Seano: We met a trail crew who gave us fresh oranges !! best oranges in the world. Then it was on. Hot! We finished the day at Deep Creek Hot Spring, a marvel of nature assisted by some locals, apparently, who have built a series of concrete-and-riverstone pools, several of them PERFECTLY hot. An afternoon and evening in those pools and in the cold creek cured so much that ailed us. Several thru-hikers were there, including Dog, the Donald, Last Minute, Tina & Louisa from Germany, Portrait, 3Bears, Justin, Ben (Jubal), Houdini, and others. Several locals were here, as well. One last hot foot bath before hitting the trail. We passed the 300-mile mark today. Woo-hoo! We cowboy-camped on the beach, spiders be damned. Beautiful with the sound of the waterfalls and rapids, the stars wheeling above us, and the light from the locals' campfires shining up on the alder trees along the creek. Chuck and Chris (Pan and Dionysus) went back for night soaking ~ while I worked on this.